1. 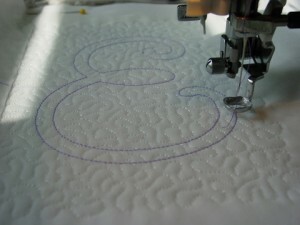 Your stitch count is much lower than it would be if you had to do 5″ lettering. That means less thread is being used and less time spent sewing out the design. 2. The design is so much more pliable – not as hard as a board as some filled designs can be. 4. 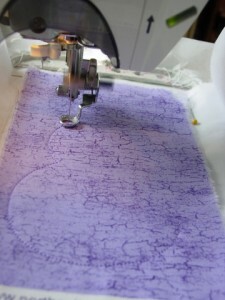 It is easy to create matches to other fabrics used in a piece of clothing, curtains, etc. 1. Hoop your stabilizer (I use medium weight tear away most of the time) and attach your fabric that you want to put the applique on to the stabilizer. I usually use Gunold’s KK100 (no CFC) ahesive spray. 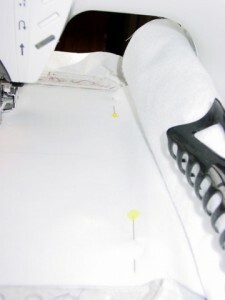 I spray the back of the fabric and place it on top of the stabilizer, securing it with 3-4 straight pins along the edge of the inside of the hoop. Okay, back to the tutorial. 4. 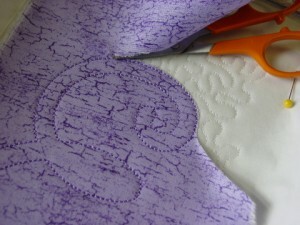 Now get your piece of fabric that will cover this outline and make sure it’s big enough. I like to starch and iron it, then apply adhesive spray to the back of the fabric and place it over the outline. Sometimes, I secure the applique fabric with a couple of straight pins, just to make sure it’s not moving when the machine starts stitching. Now stitch the tack down color = number 2. 4. When the machine stops after the tack down, remove the hoop from the machine, but do NOT unhoop anything. 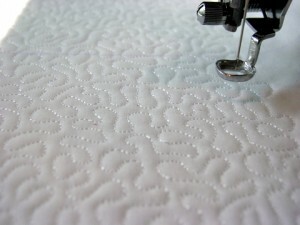 Take small, curved scissors and trim away the fabric close to stitching line. 5. After trimming, place the hoop back onto the machine. 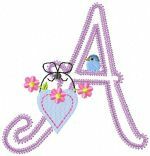 And allow the machine to stitch the next color which is the applique stitch and follow the text instructions for any add on designs. 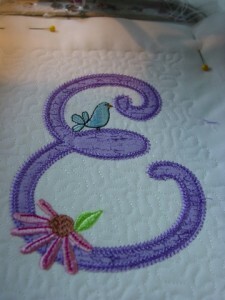 A word of caution: When you stitch out my applique Country Garden lettering, be sure you follow the text carefully. 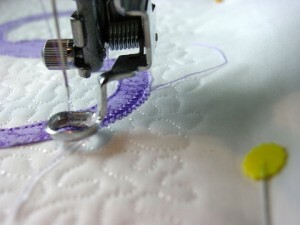 Sometimes, in order to hide a flower stem or the edge of a birdhouse underneath the applique edge, the stitching sequence of those three applique steps may have been slightly altered. If you follow my typed instructions, you should have no problems with it whatsoever. Thank you, have not attempted applique before but your tutorial makes it look really easy, will let you know how it turns out.